OR Grab your own copy of DOG BONE SOUP here at “YOUR AMAZON” and dive right in! Anyone who grew up in the 1950’s and 1960’s or who has a grandparent or parent who has told them stories about it, will truly empathize with this coming of age novel. It touches on so many timeless issues like poverty, alcoholism, bullying, domestic violence, family relationships, and self-identify crises. There are many touching and authentic incidents described in a way that makes the characters so alive and appealing to the reader. Shawn Daniels is the oldest child in a poor family living in a small rural town. They live in a unfinished house that has no bathroom, running water or heat, yet his dad finds money for a TV. Dad spends most of his time drinking or bullying the family. When a friend from school spends the night, everyone at school learns of Shawn’s plight and make fun of his situation. Shawn’s mother is very proud; she works several jobs to make ends meet. At the same time Mrs. Daniels refuses to accept help from “uppity rich folks.” Largely left to his own resources, Shawn accepts responsibility for the family, he learns about logging, gardening; he will do what is necessary by stealing apples or teaching himself how to milk a cow and then steal the milk. By the time Shawn is in high school and his mother finally divorces his father, he faces the difficult decision of whether to maintain his dream to attend college or accept reality and his self-imposed family responsibility. His choices are to leave home to join the military and perhaps face death fighting in the Vietnam War or living on another family’s charity while finishing high school. This book is written from the heart. Though the setting is over fifty years in the past, the issues remain contemporary. I feel that the book is appropriate for young adults and adults or mature middle grade students. There are a couple of curse words. Well-written, worthwhile and powerful in scope and detail. Sounds great – I love historical fiction! Then I suggest you put this one on the top of your list. Sounds really interesting, and a great theme! Visiting from the Kid Lit Blog Hop, sounds like and interesting book. 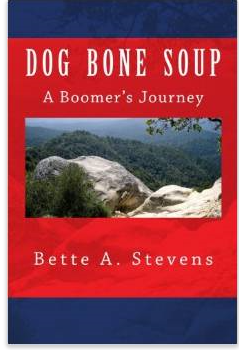 Dog Bone Soup sounds like a terrific read. I love reading stories that are told from the heart and are meaningful. Would love to read this when little one is older. Thanks for sharing the excerpt on KidLItBlogHop this week Barbara! Hooray for Bette! I look forward to reading Dog Bone Soup. Great review, Barbara! What a fantastic, attention-grabbing title! Love it! Thanks for sharing this at Booknificent Thursday! Sounds like a great adventure book! Thanks for sharing at the Kid Lit Blog Hop! I do hope that you will be feeling better soon, Bette. Thanks for reblogging!